Since 1887, Grand Hotel on Mackinac Island, Michigan beckons guests to a bygone era of old-world hospitality and charm. 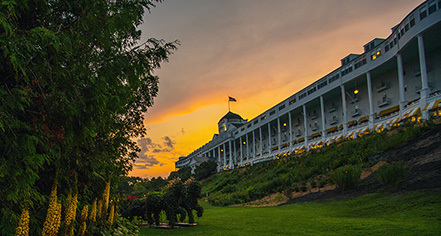 Family owned for three generations, this National Historic Landmark is one of the finest summer resort hotels in the world which has been named by Coastal Living as the Top 10 Best Summer Resort and is featured in Trip Advisor's Hall of Fame. Mackinac Island offers guests a relaxing ambiance where bicycles and horse-drawn carriages are the preferred modes of transportation. Step back to an era of dining to chamber music, Afternoon Tea in the Parlor, croquet on an endless lawn, and dancing the evening away. Enjoy a long list of modern amenities, 18 holes of golf, shopping, Astor's Salon and Spa, or sitting in a rocking chair on the world’s longest porch enjoying the views of the Straits of Mackinac and the Mackinac Bridge. All 393 guestrooms are uniquely decorated by New York Interior Designer, Carleton Varney of Dorothy Draper and Company with One Bedroom and Two Bedroom Suite options available. In 1980, the hotel served as the location for the filming of Somewhere in Time, starring Christopher Reeve, Jane Seymour, and Christopher Plummer. Beyond the hotel grounds, the island offers numerous diversions, including Fort Mackinac and other historic sites, horse-drawn carriage tours, bike riding, downtown shops and, of course, the world-famous Mackinac Island fudge. Open from May through October there are more than 25 packages available to experience one of the world's finest resort hotels. Packages include a full breakfast and five-course dinner daily. Children 12 and under stay for free. Nothing intrudes on the serenity and natural beauty of America’s Summer Place on Mackinac Island. There is no place quite like it. R.D. (Dan) Musser III at Grand Hotel was awarded Steward of History and Historic Preservation Award for the 2017 Historic Hotels Awards of Excellence. Grand Hotel, a member of Historic Hotels of America since 2001, dates back to 1887. The 1980 film Somewhere in Time, starring Christopher Reeve and Jane Seymour, was shot on location here. Accessible Rooms: Please contact hotel for more information. Cancellation Policy: A deposit for the first two nights is required when you make your reservation. Your reservation deposit will be refunded, less a $45.00 processing fee, with notice of cancellation at least 10 days prior to your scheduled arrival. Reservations cancelled less than 10 days prior will forfeit their room deposits. Deposit: In order to confirm the reservation, this hotel does require payment for the first two evenings as a deposit either on a Visa, MasterCard, American Express, Discover or Diners Club. If you stay one evening, payment in full is required. Not included in this rate are charges for the transfer of luggage round trip between the dock and the hotel. The fee for this service $8.50 per person and is automatically added to the deposit amount. Your credit card will be charged within the next 24 hours for the deposit amount. Hotel/Resort Fees & Taxes: Additional Charges: 19.5% added hotel charge on the above rates, 2% Mackinac Island assessment on the above rates, 6% Michigan state sales tax is added to all rates, including the added hotel charge, $8.50 per person for the round trip-transfer of luggage from the Mackinac Island ferry docks to Grand Hotel when you arrive and back again upon check-out. Occupancy Restrictions: Varies by room type. The average unit available on-property can accommodate five (5) people. Contact hotel for more information. Parking: No cars allowed on island. Ample parking is available at all mainland ferry docks. All ferry lines offer complimentary outdoor parking. Indoor and valet parking are available for nominal charges. Payment: Grand Hotel accepts Visa, Master Card, Discover, American Express and Diners Club credit cards for room deposit and final payment of bills. Personal checks, travelers checks and cash will be cheerfully accepted. Pet Policy: Service animals allowed: Please contact hotel for more information. Pets allowed: No. Transportation: Is by horse-drawn carriage, bicycle, or foot on Mackinac Island. 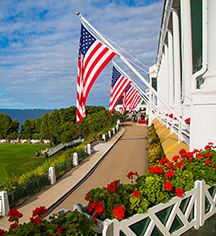 Since 1887, Grand Hotel on Mackinac Island, Michigan beckons guests to a bygone era of old-world hospitality and charm. Learn more about the History of Grand Hotel .